Title: "Enter... Dr. Doom!" / "The dismal dregs of defeat!" / "Doomsday" / "The peril and the power!" The FF (minus the Human Torch) get lured into a trap set by the Sandman and the Wizard at the state prison. I'm not sure what the point of the trap was. The Sandman escapes from jail, but couldn't he have done that without the FF being there? Anyway, the Sandman looks really cool in these opening panels so it was worth the lack of a sensical plot. Meanwhile, Dr. Doom has invited the Silver Surfer to his palace in order to steal his powers. Later, the Sandman shows up at the Baxter Building and steals a bunch of Reed's equipment in order to bring something useful back to the Wizard so that he can escape as well. Meanwhile meanwhile, Wyatt Wingfoot and Johnny Storm are dimension hopping, being teleported around by Lockjaw, and the Inhumans are, yep, still locked in their negative barrier. ...and Sue and Reed feeling a sense of danger. Pretty interesting at this time for a book to end with no real resolution. Comics are starting to mature. The next issue is essentially a huge fight scene. Johnny and Wyatt rejoin the FF via Lockjaw and they all try to defeat Doom, who toys with them. The FF survive only by appealing to Doom's vanity - because they surrender and acknowledge his superiority he lets them live. The third issue in this arc shows Doom crisscrossing the globe, demonstrating his power without opposition. 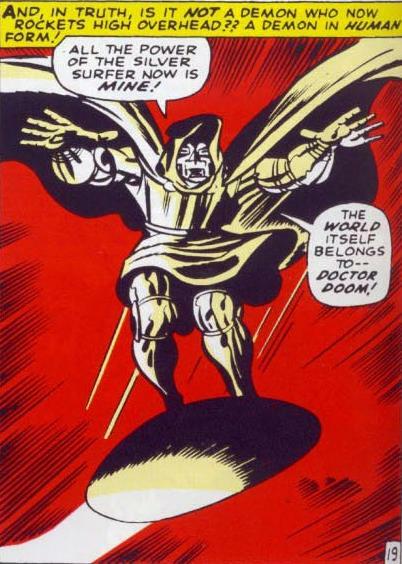 This is the first Dr. Doom comic to be labeled Doomsday. Doom doesn't really do much with his powers besides cause mayhem. He's basically achieved ultimate power here, but other than going on a rampage and pursuing his vendetta against the Fantastic Four, he's not really trying to do anything with his godlike abilities. In the future we'll see that Doom always becomes bored whenever he does conquer the world; maybe we're seeing something similar. Doom returns home to taunt the Silver Surfer a bit. Meanwhile, Reed works on the doohickey that will defeat Doom. At least in this case there's a little bit of strategy behind the doohickey, i.e., it's not the device itself that will save the day. Also at this point, Black Bolt sends all the Inhumans underground and gives a big shout, breaking the Negative Barrier and freeing his people. ...while waiting for Stark Industries to build a giant version of the doohickey Reed was working on last issue. When it arrives, it saps Doom's strength but it seems to fail since it doesn't defeat him completely. It then flies up into outer space but when Doom tries to follow it he crashes back to Earth, due to the barrier Galactus put in place preventing the Silver Surfer from leaving the planet. The real purpose of the device was to make Doom mad and therefore irrational. I've always felt that Galactus would have been a little more specific in his banishment of the Surfer but at least the resolution to this major arc was better than most, especially in comparison to the way Galactus himself was defeated. Overall this has been a good multi-part story with some real drama as Doom goes on his rampages and decent character moments as the rest of the FF balk at Reed's surrender and lack of subsequent action. Kirby's art is quite good, from the opening scenes with the Sandman to the demonstrations of Doom's power. When Doom first gets his powers and there's a sense of menace in the air, there's a cute sequence with the Thing scaring himself reading a ghost story. Historical Significance Rating: 4 - Inhumans are free, first time Doom acquires the Power Cosmic. Black Bolt screamed to deactivate the bomb that he tried to use to blow up the negative barrier in Fantastic Four #54 (incorrectly footnoted as #55). The Thing crushed Dr. Doom's hand in Fantastic Four #40, and Doom is still bitter about it. That Kirby splash figure of the Sandman was reprinted in a backup feature in a later Spider-Man annual, which weirdly colored his shirt wrong(it was never anything but green before). Oh man this is one of my favorite old school Dr. Doom stories. I thought Reed's solution for defeating Doom was pretty creative writing too. Hi fnord12, Crystal should be added to the "Characters Appearing" section here. Maybe you need to start adding a category for stories that were adapted into movies? This was adapted into the 90s cartoon, too - there's even the scene with Ben reading the ghost story and the Silver Surfer's dialogue in that scan where he's imprisoned is recited word by word. Clearly from how quickly they brought the Surfer back they knew they really had a winner with him. This was lampooned brilliantly in Twisted Toyfare Theatre when the Hulk accidentally comes in and ends up with the Power Cosmic (I've always loved that phrase). I think my favorite part of all this is Sue making Doom fly into an invisible mountain. Even Doom looks depressed and defeated with himself for doing that, instead of being angry. Sandman also wore Frightful Four team colors, usually a red horizontal striped shirt styled just like his green one, and purple pants, in all or most of his appearances as a member of the evil FF. I loved this one as it had Doom at his best. The solution was cool and tied in with the Surfer's back story. Apparently Ben likes horror fiction because years later he is shown at different times reading Dracula, the Shining and Salem's Lot.